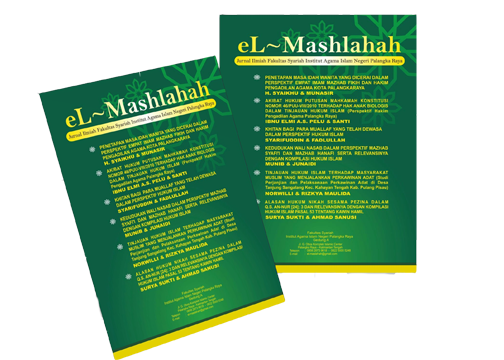 El-Maslahah invites you to submit articles to be published in the journal. The articles may be from legal research or conceptual articles, and within all fields of Sharia, Islamic Law, Law Positive, Sharia Economic Law, and Contemporary Islamic studies. The journal will be publishing 2 times per year (Juni and December). In our journal there are two languages, namely in the abstract the English language and in the articles using Indonesian. All published articles are available online. These articles undergo the rigorous double-blind peer-review process. For further details on submission standards, please contact us at the email: iainfasya@gmail.com.